The partnership between Nike and Dafne started at the 2012 Olympic Games in London. At the time just 20 years old, Dafne was known as a very talented heptathlete. Competing in a sold out Olympic Stadium, she showed not only the 80,000 attendees what she was capable of, but the rest of the world too. Dafne’s raw talent combined with her characteristic focus and determination to excel, made the collaboration with Nike a natural match. After three years of great heptathlon success but also an aggravating knee injury, Dafne chose to focus on the discipline she was best in: the sprint. It took mere months for her to demonstrate it was the right decision: she became one of the fastest women in history, and world famous in the process. Both her unique performances and Nike’s athletic omnipresence have elevated her truly to a global level. Since then, Dafne and Nike have worked on world class campaigns where she has a prominent place amongst the brand’s greatest sports ambassadors. The sport of track and field is all about timing. Everything has to be perfect. The time on the finish line literally shows how perfect that race was. The partnership between Dafne and luxury watch brand Hublot started in 2017 and is in many ways a sublime match. Dafne’s values resemble Hublot’s and reflect their ethos. Elements such as dedication and focus, never compromising when a goal is set. Both Hublot and Dafne always strive for the best, aiming for nothing else than the top and believing in pushing the boundaries, going beyond. It’s all about staying true to their DNA and philosophy. Being different than others. And challenging the conventional ways of creating perfection. Becoming – and staying! – one of the fastest women in the world is not just about hard work and determination. It’s a way of life. Perfection is the standard. Things that can be controlled should not be left to chance. So, taking care of your body and mind is the bare minimum for Dafne. Her passion for healthy and natural food plus her advanced knowledge of products and nutrients over the years, led to a textbook match with Campina in 2016. Both are down to earth, compassionate, approachable, feet solidly planted in Dutch soil, yet with an international presence and view. Dafne and Campina acknowledge the importance of dairy products, as they play a vital role for muscle build-up and recovery. Since their partnership Campina and Dafne collaborated on numerous campaigns, promoting and creating new products, as well as in addressing social issues such as helping school kids to get more active. To many people, driving a Porsche is highly desirable, combining elegance, prestige, craftmanship, heritage and, most of all, speed. So, it’s no coincidence Porsche and Dafne crossed paths and started collaborating in 2017. The sportscar manufacturer and Dafne share many facets, such as eye for detail, the pursue of excellence and the relentless chase for unprecedented results. Dafne drives a Porsche Macan. It’s a car that’s sporty, comfortable and extremely efficient with its energy. Driving a Macan makes sure that Dafne arrives at her training and race locations fully relaxed and ready to go. 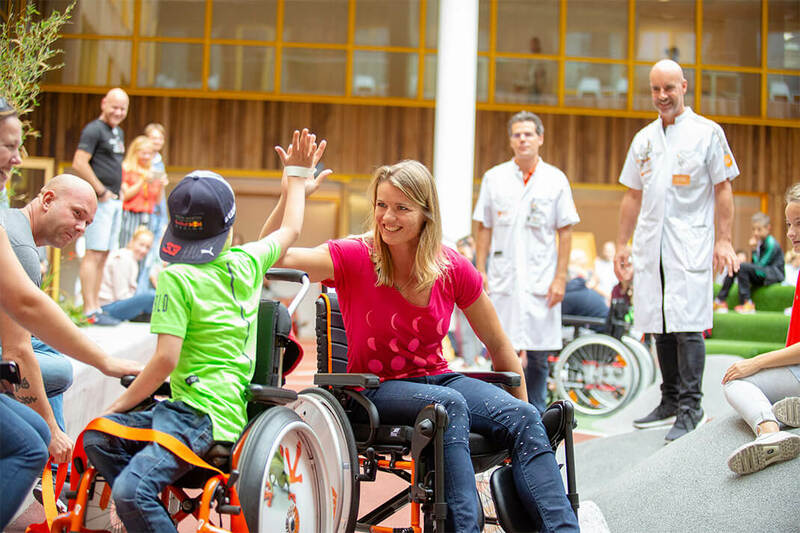 The Princess Maxima Centre (PMC) for pediatric oncology is a center established to minimize child cancer in the Netherlands. The Center is unique in that it brings together all the strands of the highly complex care and research for children with cancer. Their mission is to cure every child with cancer while maintaining their quality of life.